(Phys.org)—The Calar Alto Legacy Integral Field Area survey (CALIFA survey) has published a first set of data, offering views of one hundred galaxies in the local Universe at an unprecedented level of detail. 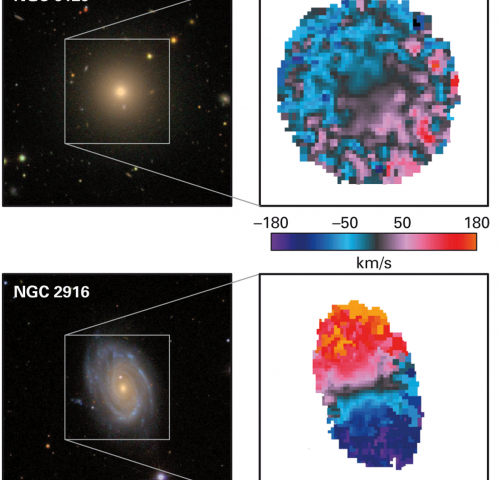 The new data represent the first large-scale effort at "two plus one" mapping of galaxies: for every pixel within each two-dimensional image, a detailed ("spectral") analysis can be performed, providing information about dynamics and chemical composition. These, in turn, yield key information that will allow scientists to reconstruct the structure and dynamics of galaxies, as well as their evolution over time. Galaxies are the large-scale building blocks of the cosmos. Their visible ingredients include between millions and hundreds of billions of stars as well as clouds of gas and dust. "Understanding the dynamical processes within and between galaxies that have shaped the way they are today is a key part of understanding our wider cosmic environment. ", explains Dr. Glenn van de Ven, a member of the managing board of the CALIFA survey and staff scientist at the Max Planck Institute for Astronomy (MPIA). Traditionally, when it came to galaxies, astronomers had to choose between different observational techniques. They could, for instance, take detailed images with astronomical cameras showing the various features of a galaxy as well as their spatial relations, but they could not at the same time perform detailed analyses of the galaxy's light, that is "obtain a galaxy spectrum". Taking spectra required a different kind of instrument known as a spectrograph, which, as a downside, would only provide very limited information about the galaxy's spatial structure. An increasingly popular observational technique, integral field spectroscopy (IFS), combines the best of both worlds. The IFS instrument PMAS mounted at the Calar Alto Observatory's 3.5 metre telescope uses 350 optical fibres to guide light from a corresponding number of different regions of a galaxy image into a spectrograph. In this way, astronomers are not restricted to analysing the galaxy as a whole – they can analyse the light coming from many different specific parts of a galaxy. The result are detailed maps of galaxy properties such as their chemical composition, and of the motions of their stars and their gas. For the CALIFA survey, more than 900 galaxies in the local Universe, namely at distances between 70 and 400 million light years from the Milky Way, were selected from the northern sky to fully fit into the field-of-view of PMAS. They include all possible types, from roundish elliptical to majestic spiral galaxies, similar to our own Milky Way and the Andromeda galaxy. The allocated observation time will allow for around 600 of the pre-selected galaxies to be observed in depth. The resulting data could revolutionize astronomers' understanding of galactic dynamics. Dr. Knud Jahnke, one of the co-founding members of the CALIFA project, is excited about one possibility in particular: "Large amounts of gas in these galaxies are being ionized – intense radiation is stripping the gas's atoms of electrons. CALIFA allows us to study these processes in unprecedented detail." With surprising consequences, as graduate student Robert Singh adds: "For the past 30 years, astronomers thought they understood the origin of this ionizing radiation. But our initial analysis strongly suggests that the standard paradigm is wrong." "Even the mysterious dark matter in these galaxies can no longer evade detection", adds Dr. Mariya Lyubenova, a postdoctoral research fellow at MPIA. Dark matter accounts for roughly 20% of the total energy content of the Universe, but its exact distribution within distant galaxies is difficult to determine. However, whereas dark matter cannot be seen directly, its gravitational attraction influences the motions of a galaxy's stars and gas. CALIFA will be able to track these motions with great precision, allowing the galaxy's dark matter distribution to be uncovered. It is important to note that CALIFA is a legacy survey: all of its data will become freely available online to be used by scientists world-wide. The data on an initial set of 100 galaxies are now being released. CALIFA is the first IFS study to be explicitly designed as a legacy project and, upon completion, it will be the largest survey of this kind ever accomplished.